Wedding photos at the Denver Museum of Nature & Science give you the best of both worlds; convenient urban amenities with a modern look and sweeping mountain views to remind you that you are in Colorado. 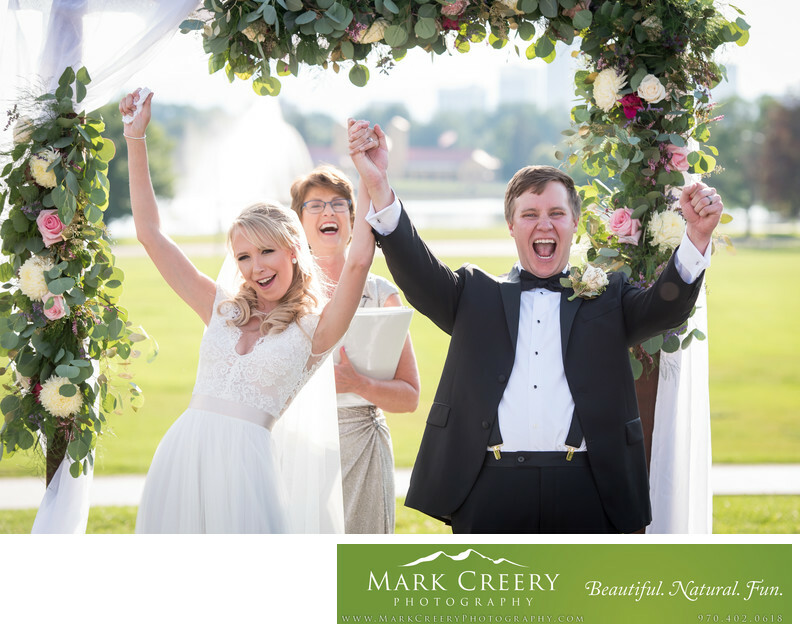 Sarah and Sean were pumped up after being announced as husband and wife to their adoring friends and family, so they lifted their arms in celebration in this candid photo. The bride and groom were ecstatic after the culmination of over a year of wedding planning came together. The ceremony took place in the Rose Gardens, and the arch was draped with pastel and white roses to compliment her dress and veil. The weather was cloudy most of the day, but the clouds parted to make for a hot July ceremony. There is no shade available for a wedding there if you'd like a view of the mountains in the background. The bride and groom had buried a bottle of bourbon in the rose garden a month before the wedding as a Southern tradition that is supposed to ward off rain on the wedding day, and it worked! The couple had their reception in the large room overlooking the City with 3 floors of windows. The bride's getting ready room actually overlooks the city and is surrounded by glass. Cocktail hour took place on the roof to maximize the views. The Denver Museum of Nature and Science is located in Denver, Colorado, next to the Denver Zoo.